As the immediate threat of a US-led campaign against Syria recedes, some semblance of decidedly bearish calm has returned to the oil markets. The last two weeks have seen steady declines in benchmark prices as the Assad regime agreed to a Russian-led initiative aimed at opening up the Syrian chemical weapons arsenal to international inspection. Jury is still out on whether it will work, but that’s enough to keep the oil market bulls in check. Supply-side analysts also took comfort from the improving situation in terms of Libyan production. However, an appreciable caveat needs to be taken into account here. Libya’s oil production has recovered, but only to about 40% of its pre-war rate of 1.6 million barrels per day (bpd), and is currently averaging no more than 620,000 bpd, according to the government. A further lull in violence in Egypt has helped calm markets as well. Much of the market fear in this context, as the Oilholic noted from Oman a few weeks ago, was invariably linked to the potential for disruption to tanker traffic through the Suez Canal which sees 800,000 barrels of crude and 1.5 million barrels of petroleum distillate products pass each day through its narrow confines. Furthermore, it wasn’t just the traffic between the Red Sea and the Mediterranean Sea via the canal that was, and to a certain extent still is, an area of concern. Disturbances could also impact the Suez-Mediterranean pipeline which ferries through another 1.7 million bpd. Syria, Libya and Egypt aside, Iran is sending conciliatory notes to the US for the first time in years in its nuclear stand-off with the West. Factoring in all of this, the risk premium has retreated. Hence, we are seeing are near six-week lows as far as the Brent forward month futures contract for November goes. There is room for further correction even though winter is around the corner. On a related note, the WTI’s discount to Brent is currently averaging around US$5 per barrel and it still isn’t, and perhaps never will be, sufficiently disconnected from the global geopolitical equation. Shame really, for in what could be construed further price positive news for American consumers, the US domestic crude production rose 1.1% to 7.83 million bpd for the week that ended September 13. That’s the highest since 1989 according to EIA. At least for what it’s worth, this is causing the premium of the Louisiana Light Sweet (LLS) to the WTI to fall; currently near its lowest level since March 2010 (at about $1.15 per barrel). Moving away from pricing matters, the Oilholic recently had the chance to browse through a Fitch Ratings report published last month which seemed to indicate that increasing state control of Russian oil production will make it harder for private companies to compete with State-controlled Rosneft. Many commentators already suspect that. Rosneft's acquisition of TNK-BP earlier this year has given the company a dominant 37% share of total Russian crude production. It implies that the state now controls almost half of the country's crude output and 45% of domestic oil refining. Fitch analyst Dmitri Marinchenko feels rising state control is positive for Rosneft's credit profile but moderately negative for independent oil producers. “The latter will find it harder to compete for new E&P licences, state bank funding and other support,” he adds. 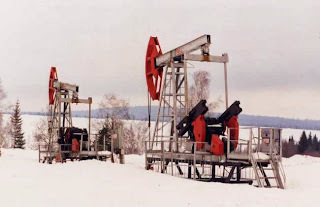 In fact, the favouring of state companies for new licences is already evident on the Arctic shelf, where non-state companies are excluded by law. However, most Russian private oil producers have a rather high reserve life, and Marinchenko expects them to remain strong operationally and financially even if their activities are limited to onshore conventional fields. There is a possibility that this monopoly could be partly lifted due to political pressure from Rosneft and Novatek. But even if this happens, Marinchenko thinks it is highly likely that Gazprom would retain the monopoly on pipeline exports – which would continue to support its credit rating. Continuing with the region, Fitch also said in another report that the production of the first batch of the crude stuff from the Kashagan project earlier this month is positive for Kazakhstan and KazMunayGas. The latter has a 16.8% stake in the project. Eni, a lead member of North Caspian Operating Company, which is developing Kashagan, has said that in the initial 2013-14 phase, output will grow to 180,000 bpd, compared with current output from Kazakh oilfields of 1.6 million bpd. Kashagan has estimated reserves of 35 billion barrels, of which 11 billion barrels are considered as recoverable. The onset of production is one reason Fitch expects Kazakhstan's economic growth rate to recover after a slight slowdown in 2012. Meanwhile, KazMunayGas expects the Kashagan field to make a material contribution to its EBITDA and cash flow from next year, the agency adds. Increased oil exports from Kashagan will also support Kazakhstan's current account surplus, which had been stagnating thanks to lower oil prices. However, Fitch reckons foreign direct investment may decline as the first round of capital investment into the field slows. What's more, China National Petroleum Company became a shareholder in Kashagan with an 8.3% stake earlier this month. Now this should certainly help Kazakhstan increase its oil supplies to China, which are currently constrained by pipeline capacity. Watch this space! That’s all for the moment folks! Keep reading, keep it ‘crude’!